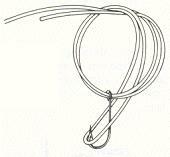 The Palomar Knot is a general purpose connection recommended in joining fishing line to swivels, snaps, hooks and artificial lures. The double wrap of line through the eyelet provides a protective cushion for added knot strength. Holding standing line between thumb and forefinger, grasp loop with free hand and form a simple overhand knot. Pass the hook through loop and draw line while guiding loop over top of eyelet. Pull tag end of line to tighten knot snugly and trim tag end to about 1/4 inch.